Juanita Limas is a PhD candidate and HHMI Gilliam Fellow in the Department of Pharmacology within the UNC School of Medicine. 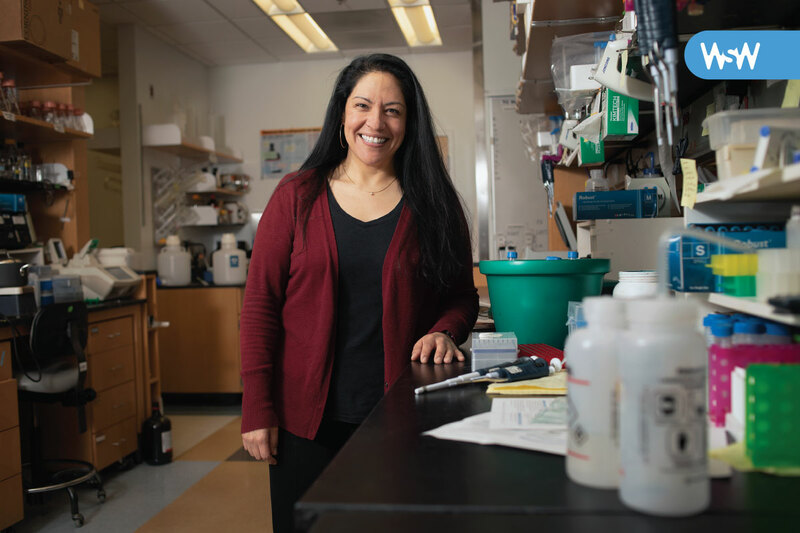 Her research focuses on genes with the potential to cause cancer, specifically those that disrupt the cell cycle by affecting mechanisms of DNA replication. Growing up, I wanted to be a civil engineer. This interest intensified when I served in the Peace Corps in Nicaragua and traveled to other countries in Central America. I watched how bridges, roads, and buildings were built and found it fascinating that the codes and standards were so different from those in the United States. I always said that if I were to do this all again, I would become a civil engineer and work both in the United States and the developing world. I taught at a community college for several years prior to returning to school for my PhD. At that time, I ran a program targeting the underrepresentation of minorities in STEM fields. One day, a student in the program asked: “Why do you want us to get a PhD when you don’t have one yourself? You talk about being in the lab all the time but all you do is teach.” That planted a seed about what I really wanted to do with my life. In considering my field of study, this was easy: I had always been interested in cancer. My mom died from cancer 20 years ago, and the disease has affected many people in my family, as well as several friends of mine. For me, this is personal. 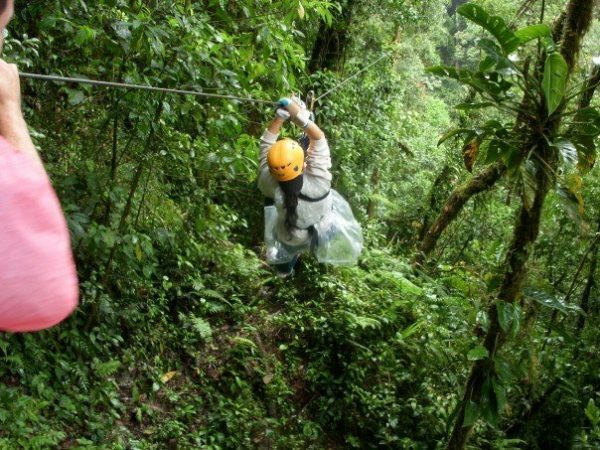 Limas ziplines through the canopy in the Panamanian rain forest. When I first arrived in Nicaragua for the Peace Corps, I learned that the village where I lived received almost two feet of rain during Hurricane Mitch. At the time, recovery efforts had already begun, but the villagers were clearly traumatized. Every time it rained heavily, people would talk about the hurricane, the people who died, and the lack of an evacuation plan. I realized there was no map of the community, so I proposed meeting to discuss one. After a series of meetings, the map evolved to not only include every house and dirt road, but also every house that had a donkey, horse, bicycle, cart, wheelbarrow, or other moveable items that could be utilized in the event of an emergency. It became so elaborate that I included it in my six-month report to the Peace Corps. They asked me if I would be willing to travel across the country to teach other volunteers how to start a project like this at their sites. They saw it as a great way to build trust between villagers and volunteers. My group’s map came in quite handy during the last year of my service: We received many heavy storms during the rainy season that washed out some of the roads, but because we knew where resources were located, we were able to evacuate people before they lost their lives. I love talking to groups about the Peace Corps. It allows me to share what my life was like before research and to educate people in the United States about life in other parts of the world. I’ve also been asked to be a keynote speaker at a variety of conferences to share my story and my research. As a thrill-seeker, I love the feeling of zipping over trees and vast swaths of land as fast as possible. I have ziplined in six different states, Nicaragua, and Panamá. My best experience was in Nicaragua: the views were incredible. I enjoy hiking and exploring new parks/areas. I believe it’s important to have passions outside of research because they help keep you grounded. It forces you to step away from the bench. Sometimes the best ideas I have for my research are when I’m not in the lab. This entry was posted in Health, Women in Science Wednesdays. Bookmark the permalink.